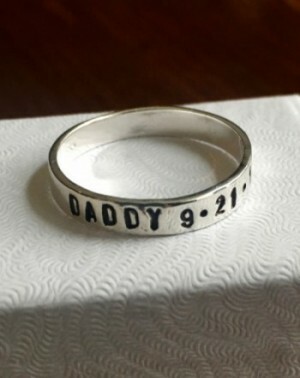 Personalize a father’s ring for a special dad with the names of his children or meaningful message- a unique gift he will treasure forever. Band measures 4mm- personalize with up to 15 characters. Categories: Best Sellers, Dads & Grandpas, Gifts, Hand Stamped Rings, Holiday Gift Ideas, Men's Gifts, new, Rings, Rings for Men.